Twinkles glow with stamps Open until Oct 30th. Monis Creative Place open until Oct 30th. Kc242 Designs by Denise open until Oct 31st. Franmade WoJ candy open until Oct 31st. Cuttlebug Challenges Open until Nov. 2nd. Crafty Makes WoJ open until Nov. 1st. Good evening my stamping friends. I completed another challenge, yayyyyy! I absolutely love doing challenges. I am really bad with colors and even placement so the challenges are really a motivator for me. This one is from Mojo Monday Week #110. This creation is similar in the way of the color scheme and the materials that I used. I love the purple,orange and black together. Really nice combination for Halloween. I also paper pieced the pumpkin with my Stampin Up! oval punch and the sizzlits from stampin Up! and the sentiment is from "pumpkin patch" from Stampin Up! Also used was my A2 embossing folder "Swiss Dots" which is my favorite EF. Also used was my circle scalloped Nesties in black and purple. The card is a square 5 1/4 X 5 1/4. Enjoy! Here is a card that I made to send to a friend for Halloween. I have to say that I absolutely love how this one turned out. I made the pumpkin from my Stampin Up! oval punch and also for the stem and leaves, I used Stampin Up! sizzlets. I must have been on a roll last night because, I threw this one together and was like ohhhh, I should add a little bling and when I did it was like total satisfaction. Does that sound kind of wierd? I almost don't want to send this one off, hehehehe!!! US white,basic black, purple (From my stash), only orange(for my pumpkin) and striped Halloween DP from a Halloween pack. sentiment from pumpkin patch(Stampin Up!) orange gems from me and my big ideas. also, Swiss Dots Embossing folder. scallop circle from Nestabilities. I am now working on some sketch challenges so I will be back soon! 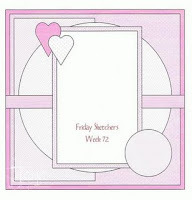 Here is this weeks Friday Sketchers challenge sketch. I made a birthday card for my neighbors daughter who is turning 18 this month and she is totally girlie so I thought these were the perfect colors for her. These are the materials that I used for this creation. Stamped image is from "Totally cool" from Stampin Up! The DP is from a birthday stack from DCWV. I also added some yellow glitter to her purse and shirt. I colored in the shopping bags with my gelly roll pens by sakura. Copics were used on her hair and pants and shoes. I printed out the Happy Birthday Brittawnya on my computer. The flower is punched from my sizzix(daisies #2) from Stampin Up! I usde my xyron to stick the flowers on and there were like these spider web pieces of adhesive that I couldn't get off so I just sprinkled some yellow glitter on it to add a little sparkle to the flower. and the green polka dot ribbon is out of my stash. and now, for the finished product. Enjoy! 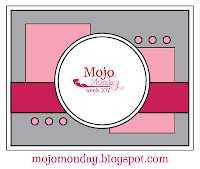 Hello my friends, Just another quick post tonight to share the Mojo Monday sketch that I completed tonight. This was a really fun sketch and I am so happy that I actually completed it within an hour. Here are the supplies that I used. Stamped image Billboardabella from Stamping Bella. Chocolate chip, So saffron, old olive and us white cs from Stampin Up! Jumbo eyelets from Stampin Up! Cottage wall DP from Stampin Up! and my Swiss dots Embossing folder. I also used my 1/16 hole punch around the scallop circle that I used my scallop circle Nestabilities to make. I also use my Spicas on her Bella's belt,boots and headband and flower. Here is my submission into Friday Sketchers #72. I was really looking forward to using my Stampin Up! Cottage Wall DP. I think it is my favorite DP of all of the papers I own(Right now) I must own 5000 12 X12 sheets, Not even kidding. I just keep buying and buying. I just love papers! So, anyways, This is what I came up with. Go on over and play along! Smooth white,chocolate chip,Old olive and so saffron cardstock. Cottage wall DP. Stamped image is from Sugar Nellie. Blue rhinestones from Me and my big ideas. Hello my Friends, Here is some blog candy that is in support of an awesome cause. Too many people have been affected with this horrible disease and we all need to continue to do what we can to help in the research of breast cancer to find a cure!So with that being said, go on over to Anytime of life, It's good to be alive and check out her awesome candy! Below is a list of the awesome goodies that Wendy is offering! What a great bunch of goodies! This candy ends October 31st.